While hilarious, I’m not sure that this tweet is worthy of discrediting the wins from monitoring twitter. I’m thinking about earth quakes like Sichuan where crowdsourcing news/emergencies on twitter has been helpful (news of the quake first broke on twitter). Monitoring twitter not only lets you be the first to know, but for you to all get a survey of how people are reacting to news and rumers. btw, love the blog, keep up the great work. Sorry for the delay and the excellent comment. I am just getting settled in Rome where I Twittered the earthquakes a while back and ended up doing a live interview with BBC as a result of my Tweets. That is why 1) why I have been neglecting my blog and 2) I totally agree and I am well aware of the fact that crowdsourcing Twitter has it’s advantages. That post was actually me trying to be funny (I thought comedy would be a decent fill in for substance) and taking the piss out of Paul Currion at Humanitarian.info who is an ardent crowdsourcing hater. (Again, a joke.) We’ve been going back and forth about the merits of crowdsourcing for some time and when I saw that I struggled but ultimately caved into my desire to post it. I actually sat on it for a couple days which I should not have done. One thing that I did run across today (to totally change the subject) and something that I should write about is the phenomenon of URL shorteners. I think I just found my new vice. I love these things. They are cute, cuddly and have names like Awe.sm and Bit.ly. I just awesome over at TechCrunch and have been monkeying with Bit.ly on and off all day. Talk about fast! Minute by minute feedback that is going to create a whole new breed of Twitter addicts. Bit.ly puts Twitter on steroids and everybody is getting into the game. Digg was the default on my Twhirl client until I set up Bit.ly and now Awe.sm gives everyone a piece of the pie. The potential here is massive and I am pretty sure there are going to be battles fought over micro turf in the not too distant future. Thanks for the comment and bear with me while I get situated. Welcome to Rome, still thought you were in CA. 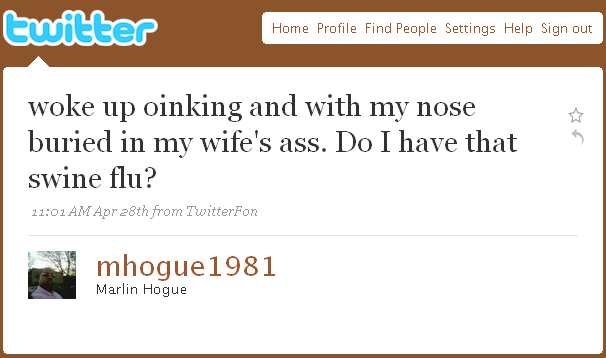 Good to know you are not writing off monitoring twitter :p and, again, this tweet was a funny find. I am also really excited about the possibilities of short URLs showing trends. Saw your post from May 5th and the link you posted to TechCrunch’s write up on bitly: http://is.gd/xyyz Also, great link drop to Mashable on the future of ‘real time’. All of this stuff is obviously really connected. I will try to drop you a line when I am in Rome in September.